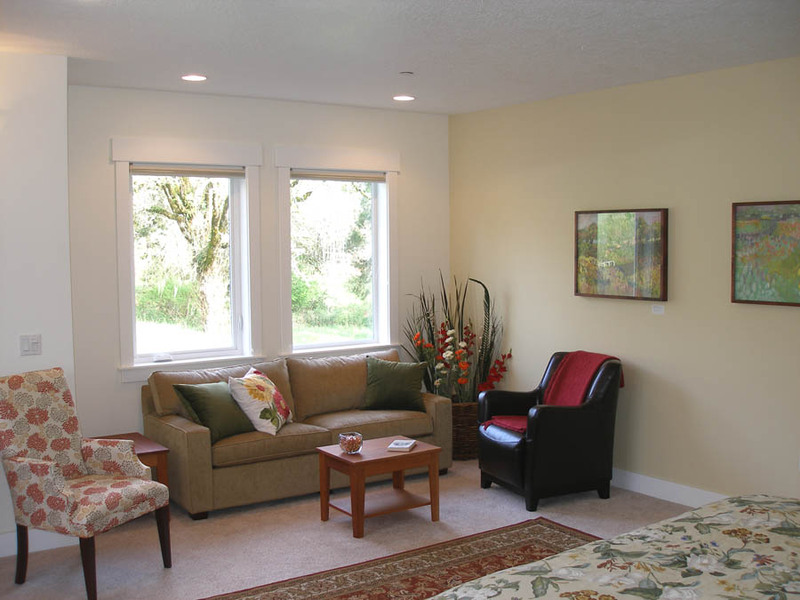 Guest Rooms at the McKenzie Orchards Bed and Breakfast -- a modern B&B Inn on the McKenzie River near Eugene Oregon. Western king top-of-the-line mattresses with memory foam top layer. 100% goose down pillows and down alternative pillows. 650 thread count 100% cotton sheets. Cozy comforters with matching pillow shams. Large closets with lots of space for all your gear. Large, openable windows on two walls for daylight and cross-ventilation. High speed internet access and wi-fi throughout the house. Wide slab-granite vanity countertop coordinated with floor and trim tile. Lots of towel hanging space. Quality soap and shampoo products in liquid dispensers. Built-in wall-mounted bathroom heaters on timers. Instant hot water at all faucets. Magnifying make-up mirrors in every bathroom. Room charges subject to 9.8% Lane County and State of Oregon Room Tax . Sweeping pasture, orchard and river views. Corner room faces east and south -- great morning light. Premium day/night window shades for daytime privacy and sleep-time blackout. Arm chair with ottoman for loafing; large cherry desk for your projects. "His and hers" shower with seat. Suite totals 419 square feet. Can accommodate roll-away twin bed for an extra guest ($25). Cozy gas fireplace for winter, air conditioned for summer. High speed internet access and wi-fi. Convenient access to ground level side door, walking path, parking, garden, and dog-walk. Guest Lounge with TV, fridge, microwave, and kitchenette across hall. Elevator takes you to main level and dining area. Rates: Two persons: $165 per night; additional person: $25; Single: $150 weekdays only with two-night or longer stay. Includes evening wine and morning full breakfast. Special Events: $195 per night. Minimum stay may apply. Click here to check availability and to reserve this room online. Arm chair with ottoman for loafing; cherry desk for your projects. Custom tiled shower with "His and hers" showerheads and windows looking over the meadow. Large walk-in shower has grab bars, hand-held shower head, and room for a seat. Toilet has grab bars. This is one of our more mobility accessible rooms. Suite totals 368 square feet. French door leads to sitting area on personal deck, patio and garden area. Rates: Two persons: $175 per night; Single: $150 weekdays only with two-night or longer stay. French door with personal entrance to lower-level patio and garden area. Shaded by enormous black walnut tree. Suite totals 488 square feet. Deluxe large two-room bathroom with double sink vanities and tub/shower in separate roomette. Guest Lounge with TV, fridge, microwave, and kitchenette down the hall. Rates: Two persons: $185 per night; additional person: $25; Single: $150 weekdays only with two-night or longer stay. Large sitting area in eastern window bay has great morning light. Ultra-premium Mitchell Gold queen sleeper sofa for family member or friends traveling together wanting to share a room or for an extra guest ($25). Suite totals 608 square feet, sleeps up to 4 persons. Locally crafted large cherry desk for your projects. Super deluxe bathroom with double vanities and premium tiled shower with "His and hers" showerheads. Elevator takes you to lower level Guest Lounge with TV, fridge, microwave, and kitchenette. Rates: Two persons: $165 per night; each additional person: $25; Single: $150 weekdays only with two-night or longer stay. This luxury top floor bedroom is our most romantic "honeymoon suite". Perched high above the meadow the dormer room has vaulted ceilings. Served by three-person capacity elevator. Four windows give sweeping views of the river and pasture; in the tree-tops of a magnificant black walnut. Super deluxe two-room bathroom with double vanities, jetted tub, and separate shower. Two person, Bain Ultra air jet tub with underwater "chromatherapy" lights and heated backrests in separate roomette. Suite totals 493 square feet. 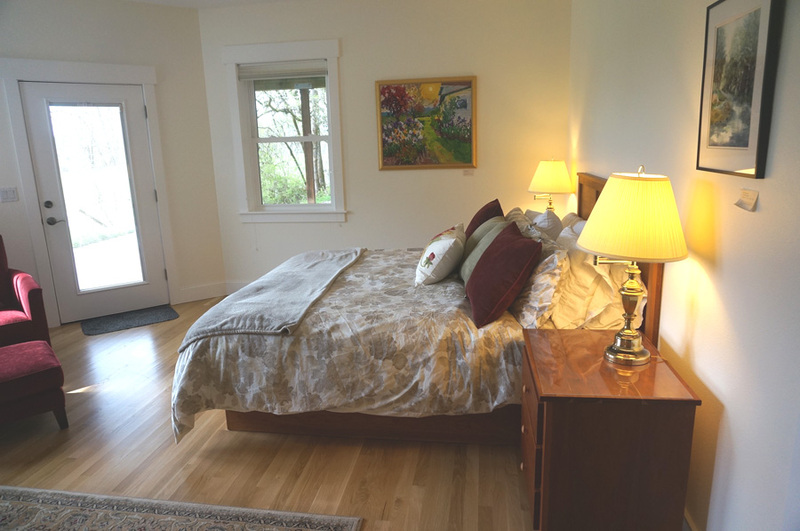 Adjacent to cozy upstairs "book nook" overlooking living room with sweeping river views. Special Events: $225 per night. Minimum stay may apply.